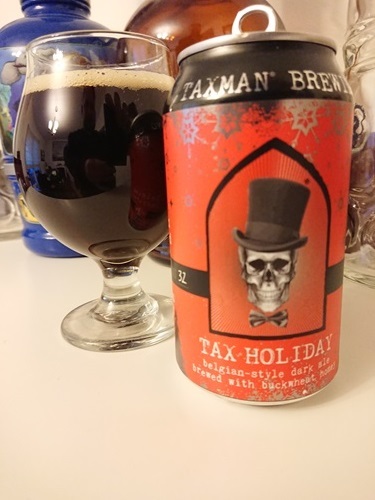 Tax Holiday is a creamy, full-bodied, reddish-amber holiday ale. Chocolate rye creates a rich and spicy malt profile, while Hunter's Farm Buckwheat Honey provides deep color, sparkling dryness and subtle notes of molasses. A blend of Pacific Gem and Saaz hops contribute warm but balanced fruit and oak flavors on the back of the palate. Ringing in at 10.0% ABV, Tax Holiday will be the perfect beer to warm up with on a cold winter's night.